Five Great Must-Have Items for Everyone in the Family | Breezy Mama Breezy Mama - Expert parenting advice, celebrity interviews, product reviews for kids, moms and babies and more! One of the coolest things about running Breezy Mama is that Chelsea and I are hip to the newest products on the market. Me, being a product junkie, especially loves this facet of the job. Here are a few great catches (for everyone in the family) that we’ve spotted in the last few weeks. The perfect idea for those wanting to give a gift that will make an impression, but not spend a fortune doing so. Lumnique candles are customizable,each one is built by you. When ordering you choose your Intention – Color – Fragrance – Gift Set (deluxe is shown at left) and then you Personalize. Chelsea received the deluxe package and was blown away by the fact that it was customized for her. That, coupled with the dramatic packaging, she declares it the perfect gift. Lumnique Candles, $25 / $30. Click here to order. These limited edition cloth diapers hit the streets to coordinate with Earth Day. It’s a reminder that we should live life a little greener, and one easy way to do that is to use cloth diapers instead of disposable. (Afraid to make the plunge? Check out my cloth diaper road test that I did this past summer–I’ve never looked back!). 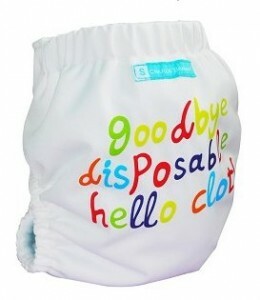 Charlie Banana’s Good Bye Disposable Hello Cloth Diaper, $25.00. (Limited stock available, one per person.) Click here to order. It’s been an unusually rainy year here in Southern California. Just as I was cursing myself for buying a cheap pair of rain boots, an email came through asking if I’d like to test these babies out. And boy did I! I wore them on a day where it stormed like no other. I was outside, collapsing pop-up tents, and having to carry them up a steep grassy incline–all in the pouring rain and 100 MPH winds. Was I tired? Yes. Were my feet dry and comfortable? YES! Made for sub-zero conditions, I can even wear them in the snow! Breezy Mama reader Rebecca also touted them on our kid’s rain boot piece. 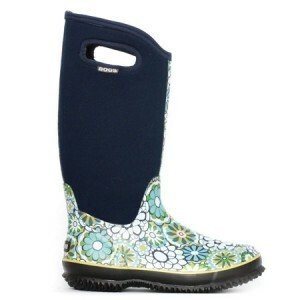 Bogs Boots / Classic Hi Ambrosia Blue, $95.00 (pricey, but TOTALLY worth it). Click here to order. Invented by two parents, this bowl is revolutionary in the way that it’s designed. The bowl inside rotates as the handle is held, so nothing spills out. In other words, little Johnny can hold the side, and as he toddles around, the bowl is constantly spinning so it stays upright. Check out this video to see how it works. 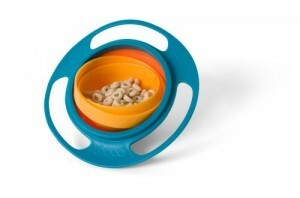 Gyro Bowl Spill Resistant Kids Gyroscopic Bowl with Lid, $13.27. Click here to order. I think the only time that I’ve been able to sit down and read a chunk of parenting advice was when I was pregnant and “What to Expect. . .” was on my nightstand. I love learning how little minds work, but reading a textbook just isn’t happening these days. Which is why I love this book. Written by two moms whose kids where in the same preschool, the advice is in the form of lists. Busy? Just read the bullet points. Have five minutes to spare? Look up the topic you’re curious about and read the explanations under each list. Makes a perfect Mother’s Day or Baby Shower gift. 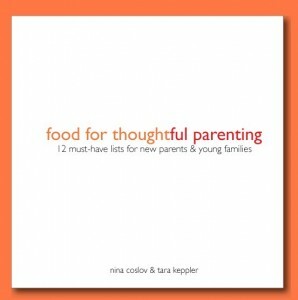 Food for Thoughtful Parenting, $14.95. Click here to order.